The present investigation had been undertaken in maize to carry out the combining ability analysis and to estimate heterosis of yield and yield contributing characters with 15 lines and 3 testers. During rabi 2010-11 the fifteen inbred lines were crossed with three testers in Line x Tester mating design at Maize Research Centre, Agricultural Research Institute, Rajendranagar, Hyderabad. 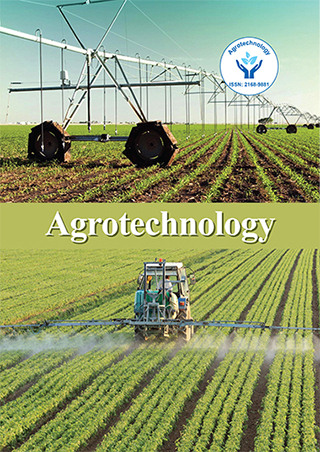 Subsequently in kharif 2011, 45 F 1 crosses along with two standard checks and parents were evaluated at college farm, College of Agriculture, Rajendranagar, Hyderabad in a Randomized Block Design with three replications. Variances due to specific combining ability (sca) were larger than general combining ability (gca) for all characters indicating pre-dominance of non-additive gene action in expression of various traits. High gca effects were noticed in inbred lines 5050, 1234, 3511-2, 3521A- 2-3 and testers BML 10, BML 7 which can be used in crossing and further exploited for improvement of traits in population. Crosses 5050 x BML 10, 3511-2 x BML 7, 1234 x BML 10. 1234 x BML 13 and 5050 x BML 7 with positive and significant sca effects and were found to be superior to standard check DHM 117 for grain yield and its components may be exploited for commercial cultivation by testing them over locations and years for their stability. V.Rajesh has completed his M.Sc. (Ag) in Genetics and Plant Breeding from ANGRAU and currently pursuing Ph.D in Department of Genetics and Plant Breeding, College of Agriculture, ANGRAU, Hyderabad, Andhra Pradesh.